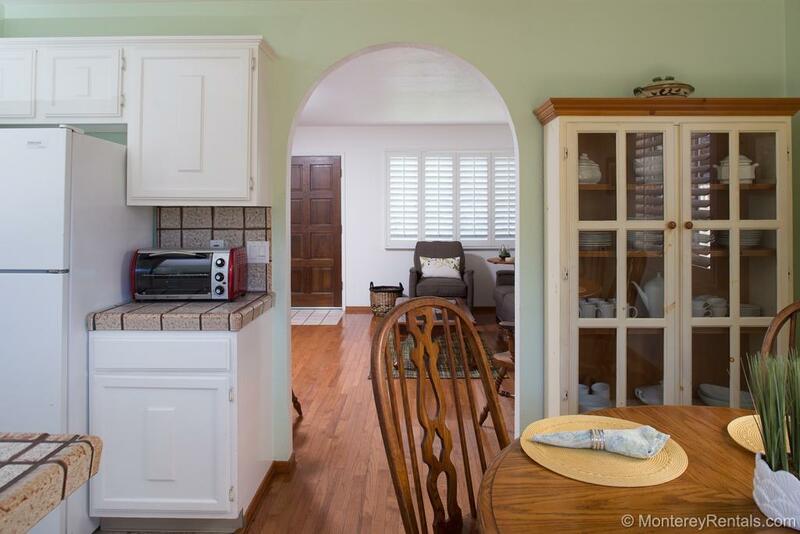 This snug Pacific Grove bungalow is a cozy place to call home by the night, week, or month. Decorated in Pottery Barn style with pastel interiors and wood flooring, this 3-bedroom 2-½-bath home sleeps six comfortably. It’s less than a mile walk to Lover's Point Beach, the Aquarium, and the shops and restaurants of downtown Pacific Grove. Take a tip from the locals, and head to Vivolo’s on Central Avenue for some of the best clam chowder this side of the Mississippi. Nice house and plenty of parking which can be a problem in Pacific Grove. For a rental that sleeps 6 the kitchen items should be upgraded to accommodate that many people ( 1-10" fry pan?). Also no cutting board.Difficult to pick up/return keys to office as the parking there is bad.We had a great time and may come back to this residence. This is a really great place to stay. My wife an I bring our 3 kids down every year. This is the best place we've stayed yet! Close to everything...Aquarium, Canary Row and beaches. Quiet neighborhood with plenty of amenities included with the house. We would definitely stay at this nice home again...Thanks! Enjoyable stay at a clean and quiet rental. A few items kept it from grading 5 stars:1. No complimentary packets of coffee.2. Picking up and returning the key to the office was a hassle. Perhaps a combination key lock box might work better. We really enjoyed our stay at the Snuggle In. The bedrooms are so spacious - we had plenty of space to spread out. Loved having laundry available in the garage. Great location - so close to everything. Will definitely stay there again!! The home was exactly as presented. It was clean and comfortable and I wouldn’t hesitate to rent it again. Snuggle Inn is a comfy little house in a great location. All the beds were comfortable and the kitchen well-supplied. The reservation process was great with clear communications leading up to our stay. We would definitely stay there again! Cute little place. Was surprised at how spacious it was inside. Beautiful view from the street looking into Monterey Bay. Would recommend this gem to anyone looking to be close to Cannery Row. The house was clean and comfortable. The location was quiet and close to shopping and restaurants. A little more pots and pans would be helpful but we got by ok. Some burners on the gas stove needs to be checked and repaired though. Heater, washer/dryer, dishwasher and televisions all worked great. We would definitely stay there again. The place was clean and had all the things we needed. The location was great. Overall, a great place! We had the best time exploring Pacific Grove and the surrounding area with Snuggle Inn as our base. The neighborhood was quiet and the neighbors polite. It was evident that every effort is made to provide everything needed for a comfortable stay and we really appreciated that. We were there during a rainy week in January. The price was fair and it was certainly cozy. Great communication with Monterey Rentals, great house, beautiful Cali! Everything we wanted aside from being on the beach! Check in was a piece of cake, neighborhood was quiet, bedrooms and bathroom were a decent size, steep driveway was not accessible for lowered cars, backyard was smaller than appeared in the photos, but no big deal for us, one electrical outlet in kitchen isn’t hooked up, poor lighting in the living room and guest bedrooms for reading so bring a book light if you enjoy reading, counter space a little small for big meal preparations, but fine otherwise. The kitchen was more well stocked than indicated in older reviews. The kids movies & Netflix was a lifesaver for the 4YO, neighbors were friendly, there is street parking but the street is very narrow. Very close to groceries, Cannery Row etc. but not quite walking distance if you have kids in tow or are out of shape. This was the first time our group opted to rent a house and we found it much more pleasant/enjoyable than staying in individual hotel rooms. Side note for anyone coming to the area though, the tap water is pretty bad (sulphur) so bring bottled water. We would rent this house again! Really enjoyed staying here.. Very comfy house and near everything . The Snuggle In was quite nice and comfortable. The rooms were nice and there was plenty of towels. The house is clean and in a very nice location. The only thing that was lacking was in the kitchen. There were only a few coffee mugs and there was not a lot of silverware. We could not find many of the basic cooking utensils like tongs. Even though it might not be considered a standard item, there was no aluminum foil while at the same time there was plastic wrap and wax paper. No towel bars in the master bath for hand towels or wash clothes near the sink. Overall a nice place but a few minor things is the difference between great and nice. We enjoyed our stay at the Snuggle In. It was pleasant, and only a 10-15 in walk (down hill) to the aquarium and the beach, one of which is a great location for watching seals bask in the sun. My only complaints were that the staff seemed unresponsive and/or abrupt prior to the trip, and that for the money we paid I would have expected it to be more updated. We apologize for any apparent abruptness and/or lack of response on our part; we make every effort to be available 24/7 to our guests. We’re glad you enjoyed your stay at Snuggle In and are sorry you felt it was overpriced. Snuggle In is by far our least expensive three bedroom home and most guests have commented on the value. The photos depict it accurately: it’s well maintained—many items have been updated, but not all. Great place to stay in Monterey! My family and I stayed at the Snuggle Inn over Labor Day Weekend, 2015. We chose this house because it was close to Cannery Row. The whole experience was excellent. The house is very cute and just the right size. The check in/check out could not have been easier. Everything was clean and very well supplied. Since we had six people, the 3 bedroom, 2 and 1/2 bath configuration was just right. Cannery Row and the Monterey Bay Aquarium were a little over 1/2 mile away. We walked there two of the three days we were there. We plan to rent this house again for another vacation. There is so much to do in the area that we barely scratched the surface in the time we had. The pick up of key and instructions were easy and we located the house with no problem. The house is quaint and room comfortable and big. Furnishing were nice and everything was clean. Our only complaint was the kitchen was lacking enough pans, pots and utensils for cooking for a party of 6. The whole point of staying in a house rather than hotel was that we could cook there. We bought a bag of artichokes and then didn't have a big enough to pit to cook them. Only 1 large pan for cooking and a sauce pan. Everything else was adequate. The neighbors came over to ask us not to park in front of their house which was not a big deal but since it's a public street we thought it was odd. Also, our first night there raccoons ran all over the roof at 2 am. The TV worked the first night but the next day we had to reset the cable box in the garage. Only other complaint was the garage was filled with a lot of stuff and lots of cobwebs and the exterior could use some paint. But all in all the convenience and location were exactly what we were looking for. Plenty of hot water for showers too!!! Would recommend to anyone looking for a nice place for a Monterrey vacation. A group of 6 of us stayed here and we were very happy with the location and accommodations. This house has 2 full bathrooms upstairs, one in the master and one in the hall. It also has a small bath downstairs which is convenient. The house is cozy and fits 6 comfortably. The best part was that it was about a 10 minute walk to the Aquarium/Cannery Row. The house was clean, and had the basic amenities. We did find the kitchen a little lacking in cooking utensils/pans, you pretty much get one of each thing. We also could not locate BBQ tools. Overall, I would definitely stay here again and would recommend it to others! This home is very comfortable, with big bedrooms and a nice living area downstairs! The beds were comfortable, and there was plenty of room for all of us. The kitchen is well stocked with appliances to use for cooking, and the dishwasher did a great job of cleaning the dishes! The house is within walking distance of Lover's Leap, and also Cannery Row. We thoroughly enjoyed the house and it's location! Just a few issues, there was a little ant problem but it didn't affect the food we had in cupboards. And there was a light out in the master bathroom that we called about and it didn't get fixed while we were there. Maybe that was so that they wouldn't disrupt our time there, but it also wasn't easy to be in the bathroom at night with no light. But again, I really liked this house and would use it again! We had a business event that brought us to Laguna Seca and we stayed at the Snuggle In home while attending the event. The home was cozy and located very close to town so easy to walk down the grocery store or into town to dine. The neighborhood was quiet and neighbors were very friendly. The home was sufficient and nicely appointed. I did find that the cookware and kitchen utensils were woefully inadequate. If it was only two people, it would be fine, but there were six of us. There was only one large pot so when making pasta I had to use the one pot to make the sauce, transfer it to a bowl, then make the pasta in the same pot as the other pot was way too small, also the largest frying pan was very small cooking about two eggs at one time. In a home that accommodates six people there is a need for cookware and cooking and BBQ utensils that will allow to preparing meals for that many people. It is an easy fix and would make the kitchen much more user friendly. We enjoyed our stay. The home was lovely, the back and front yards beautiful. It was conveniently located. The rental staff were kind and cooperative. We spent a very enjoyable three days at the Snuggle Inn. The house was very clean and the kitchen was well appointed. The walk to the Wharf area and water was five minutes downhill. We hosted family for a dinner one evening and there was plenty of space outside on the cozy patio. A family of five, including two teenagers fit well into the Snuggle In. After stocking up on some groceries we were happy to see a few things left behind by other tenants like some tea, sugar, baking powder etc. in one of the cabinets. It would have been nicer to have some "hotel shampoo" minis in the bathrooms for a really nice touch. The home is well maintained and was very comfortable for us. The furniture is serviceable, the appliances all working (including a blender)and utensils were of this century. Most of the knives needed some sharpening, however. The kitchen floor has a loose tile that could be a sign of an uneven subfloor, but that did not detract from our stay. The snuggle in is a pleasant walk to Cannery Row, but I wouldn't advise doing it at night, especially with kids (too dark). Check in and out was super easy as well. All in all great time, all good memories! We imported our Thanksgiving holiday to this home and were happy to see a well-stocked kitchen. We walked down to the bayside path every day and had a great time. It's a very comfortable family home. The house is nice; it's about a 10-20 minute walk to the aquarium, with a 4-year-old in tow. We saw deer along the way, the kids loved that. Parking for 2, and room for a full family.